Bautista Texas, Texas Panhandle Ghost Town. I have a little information on Bautista Texas. 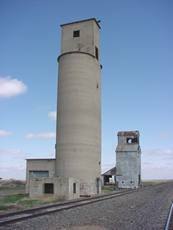 It is nothing other than an old grain elevator located approximately 10 miles south of Dumas, Texas in the Texas Panhandle. It sits approximately 5 miles west of highway 87/287. The only significance to Bautista now is that the old ATSF Railroad, now the BNSF runs through it. The siding is no longer in use either. It serves as nothing more than a station name for the Railroad. There are not even any houses around the grain elevator. I know this because I work for the Union Pacific Railroad in Dalhart, Texas and we run trains south through Bautista on our way to Amarillo and on down to Childress. I would have to do some digging to find out any dates on when the elevator was built and when it was last used. Anyone wishing to share history, stories or photos of Baustista, Texas - please contact us.